Here’s a deliciously quick and easy way to make a healthy quinoa salad that is beautiful, low in Points, and very flavorsome. 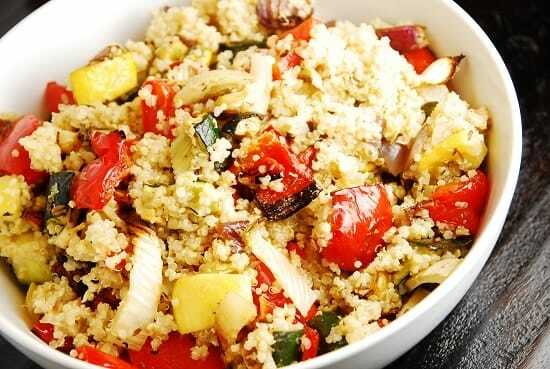 This Roasted Vegetable Quinoa Salad Recipe has just 4 Points for a 1 cup serving and makes a wonderful Weight Watchers side dish recipe that is loaded with nutrients. The delicate flavors of the roasted vegetables are not drowned in a heavy dressing, but rather lightly seasoned with dried herbs and lemon. Feel free to use your own favorite vegetables when creating this dish! It works really well with eggplant, asparagus, butternut squash, and carrot, just to name a few. It’s a very simple recipe that makes a big impact and will cost you just a handful of Points. Enjoy! A delectable and incredibly healthy quinoa salad recipe that is simple yet absolutely delicious. Delicately flavored with dried herbs, the roasted vegetables bulk up the quinoa to make a very filing and satisfying Weight Watchers side dish recipe. Preheat oven to 450. Line a large baking sheet with foil and spray with non-fat cooking spray or an olive oil mister. Prepare quinoa according to package directions. Place cooked quinoa into a large bowl and set aside. Place all chopped vegetables and garlic in a bowl, and add in olive oil and all herbs. Mix well to evenly coat all vegetables. Place vegetables onto prepared baking sheet. Place in oven and roast vegetables for about 30 minutes, or until edges begin to blacken. Let roasted vegetables cool for about 5 min, then, add them to the quinoa. Stir in lemon juice, zest and season with salt and pepper to your liking. Serve at desired temperature. Adding a drizzle of White Truffle Oil before serving finishes this off beautifully !! Delish! Loved the flavor of the roasted veggies in the quinoa. This is the first time I’ve made warm quinoa, and it was a success. Served as a side with baked balsamic chicken. Definitely put into regular meal rotation.